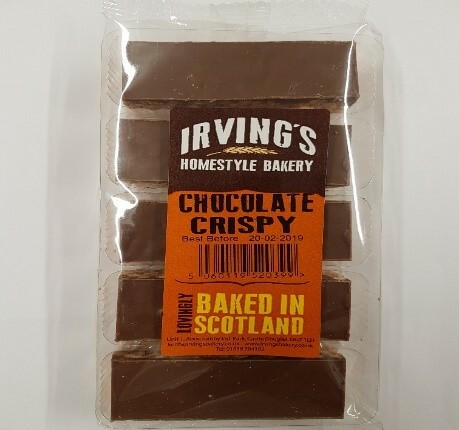 Irving’s Homestyle Bakery is recalling its individual and 5 finger packs of Chocolate Crispy because they contain wheat (gluten) which is not mentioned on the label. This means the products are a possible health risk for anyone with an allergy or intolerance to wheat or gluten. These products contain wheat (gluten) making them a possible health risk for anyone with an allergy or intolerance to wheat or gluten. 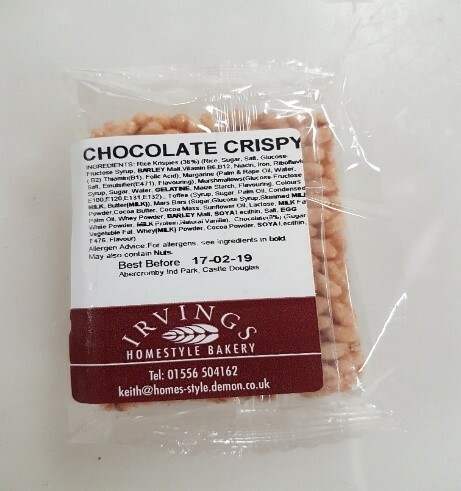 Irving’s Homestyle Bakery is recalling the above products from customers and has contacted the relevant allergy support organisations, which will tell their members about the recall. The company has also issued a point-of-sale notice to its customers. These notices explain to customers why the products are being recalled and tells them what to do if they have bought the products. See information on Food Standards Scotland’s work on food allergy and intolerance. Get advice on food allergy and intolerance here.